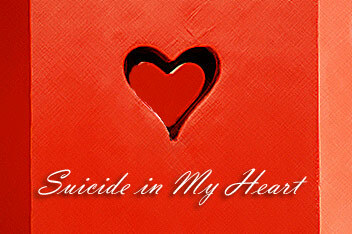 A Beautiful Poem by Suicide Survivor Patti Tillotson: Suicide in My Heart - Suicide.org! Patti Tillotson is a wonderful person who lost her daughter, Stephanie, to suicide five years ago. Patti has written a beautiful poem entitled “Suicide in My Heart” that she would like to share with the Suicide.org community. Patti opens her heart and shows her intense pain in the poem, but concludes with a feeling of hope. You are an amazing person and a GREAT mom. Stephanie is one of the greatest angels in Heaven and is watching over you with great pride and love. And you, my friend, are one of the greatest angels here on Earth. Fire light ….. Explodes with might. I can't see you ….. In the night. Ice caves ….. Covered in haze. Cold and dark ….. It's you I crave. Love at first sight ….. I held you tight. Can't keep you safe ….. Why didn't you fight? Guilt feels barren ….. Forgiveness torn. Can't delete that moment ….. Life cried forlorn. Pain pervades ….. With sharpened blades. I can't touch you … Where you're laid. Life bleeds on ….. With each blue dawn. My ache is great ….. I'm just God's pawn. Hard to cope ….. With life's last rope. Until I see you ….. Give me hope.